On behalf of the Organizing Committee, the Scientific Committee and the Executive Board of International Society for Animal Hygiene (ISAH), I am pleased to invite you to attend the XIX International Congress of ISAH 2019. The meeting will be held from 8 to 12th September 2019 in Wrocław, which is one of the most prominent tourist destinations in Poland. The ISAH Congress initiated in 1970 have been identified as an influential conference worldwide for professionals in animal hygiene, health and welfare which provides insights into the latest research results from many areas of animal science. Congress is a unique opportunity for industry and scientists to meet and acquire new knowledge as well as to exchange experience. Carried out through many plenary meetings, poster sessions as well as technical tours discussions about scientific achievements in the world livestock production are also an opportunity for the application of new ideas in practice. Furthermore, there will be a focus on international research collaboration and knowledge exchange towards innovation. All these preferences make the ISAH one of the largest animal science congresses in the world. 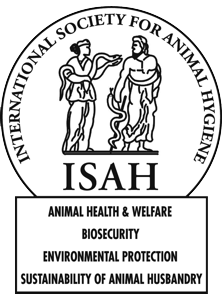 The motto of the XIXth ISAH 2019 congress is “Animal Hygiene as a fundament of One Health and Welfare improving biosecurity, environment and food quality”. The programme contains various disciplines and the latest findings regarding animal health and welfare, animal hygiene, biosecurity, safety of animal-origin food, environmental protection and sustainable production in relation to livestock production and related areas. I do hope the congress will provide to you all a unique opportunity to present your recent research results. Additionally, participation during its official parts and in the after-hours, will be another great opportunity to meet with colleagues and have a interesting discussions and ponder new problems in a stimulating intellectual atmosphere. I am looking forward welcoming you in Wroclaw, a city with a rich past and interesting present!